I start each year with a something for the student to design (color). 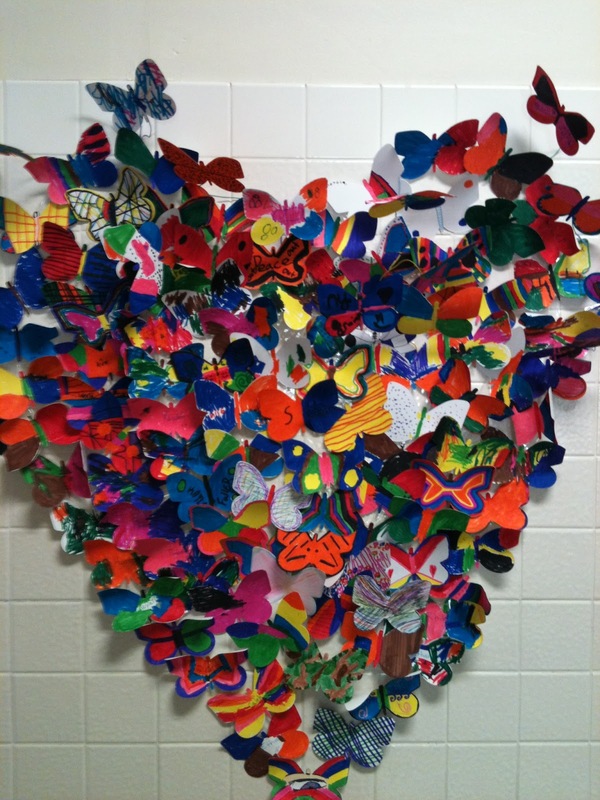 This year I gave them butterflies and spoke to them about the artist David Kracov. I started to hang the butterflies in the hall to say We ♥ Art. The math guy thought it should say We ♥ Math, another teacher suggested our school District, which I decided was the way to go to. It turned out awesome!! I used Twisty wire to make some of the butterflies pop-out. 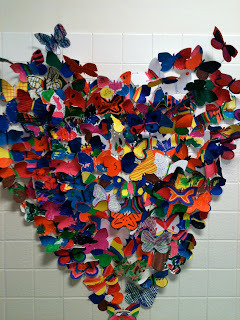 Every Child made a Butterfly, at open house the kids had a great time showing their parents which butterfly they made. This is the second year we have participated in Pinwheels for Peace. They looked beautiful glittering in the sun light I left them out for about 5 days, the students said they brought family over to see theirs over the weekend, it was a nice project. My Favorite Color? or favorite neutral? The teacher gave the students a beginning of the year survey. One question was "what is your favorite color?" A child raised his hand and said "I don't have a favorite color!!" then the child said "but I could write my favorite neutral-Black"
"That would be just fine" she replied. Then relayed the story to me. And I thought hey they listen to me!!! Every year our sixth graders research composers, musical artists, songwriter's and other people connected to music for an oral report. For the past couple years, we have had the students must a clay bust of their musical person. I know this one had a faint mouth, it did not show up well in the photo, I love the necklace!! 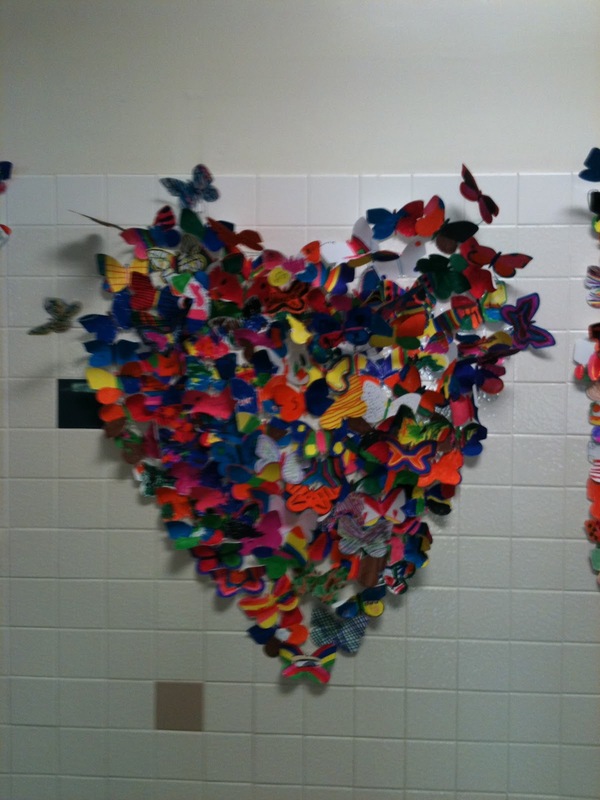 They are not realistic but they do capture the feeling of the person and the students love them. At the beginning of year, the kindergarten teachers are working on shape and color recognition, plus patterning. This turtle's shell is a paper plate with a design created with pre-cut shapes. We cut the feet and tail from green construction paper. The heads are socks, we have collected, then we added eyes.